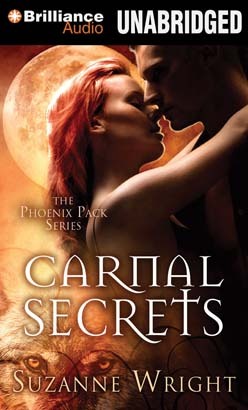 Half-shifter Shaya Critchley may hold a submissive role in her wolf pack, but the petite redhead refuses to let an Alpha male interfere in her life. Furious and humiliated after her mate refused to claim her, she runs off to hide among the humans. Why wait around for an Alpha male to love her when he’d obviously prefer to ignore her? Nick Axton can barely control his urges for Shaya, but the Alpha can never claim her — not if he truly cares for her. His degenerative brain condition will eventually destroy him, and he’s afraid of turning his mate into his caretaker. Yet when Shaya runs away, Nick can’t let her go. He pursues her, vowing to finally claim his rightful mate. And despite Shaya’s spirited and passionate resistance, Nick’s fiery determination just might be the ultimate aphrodisiac. Excellent narration making this (and all the others she has read in this series) hers. Funny, sad and a happy ending. Really good book, really like the angle of the defiance in a "Submissive" wolf. Great love story HOT HOT HOT!!! !